Would you love to learn the history of SF's North Beach neighborhood and see its most popular attractions? My 'perfect day' itinerary introduces you to all the best places to see in just one day. 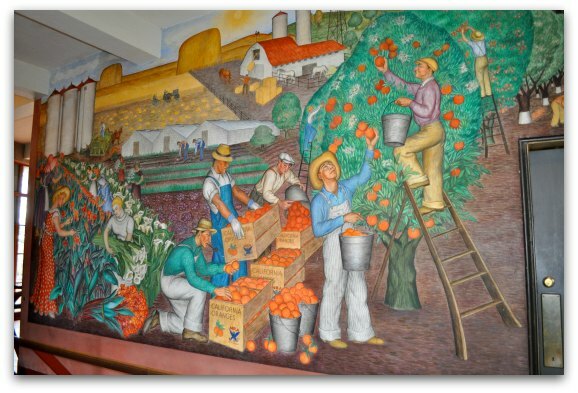 On this self-guided tour, you'll get the chance to admire the Coit Tower murals, see where Joe DiMaggio got his start in baseball and sample some of the best Italian treats in the city. You will also uncover the truth behind The Beat Generation and visit some of their favorite hang outs. Today's tour also includes a little shopping. The itinerary below includes recommendations on getting around so you can quickly move from one attraction to the next. Wear comfortable shoes as there is also quite a bit of walking. You can't visit North Beach without stopping by for a cup of Joe at Caffe Trieste. Not only do they have some of the best coffee in the city, but also a rich history. Caffe Trieste opened in 1956 and was the first espresso house on the west coast. Shortly after it opened, it became popular with local artist, writers and poets. Even today, well-known artists will stop by for coffee and one of their yummy pastries. Grab some breakfast, take a seat and enjoy the photos on the walls as you discover those that visited before you. After you enjoy up your coffee and breakfast, stroll back down Columbus Avenue to pick up the bus to Coit Tower. The 39 bus picks up near Washington Square Park and drops you off in the parking lot of Coit Tower. You will find the bus stop on the corner of Union Street & Stockton Street. The ride up the hill takes about 10 minutes and is $2 per person. Before you even enter Coit Tower, spend a little time soaking in the views from the parking lot (jump up on the cement barriers for a better look – just be careful!). From this point, you can see the Golden Gate Bridge, Alcatraz Island and Lombard Street. After you take a few photos, head inside the tower. It's free to enter the first floor where you can admire its beautiful murals and learn more about Lillie Hitchcock Coit, the woman that left money to build this famed tower. You can also pay $5 to take the elevator to the top floor for 360-degree views of the city. The windows are small though, so you can only see one section of the city at a time. One thing to note about the visit upstairs is that there are about 20 stairs to get from the elevator to the viewing area. These stairs are small and wind around the building, so I don't recommend them for anyone that has trouble getting around. Coit Tower opens at 9am from October to February and 10am from March to September. Click here for more pictures and tips for visiting. Another way to get to the tower is to take the Filbert Street Stairs. From Caffe Trieste, walk three blocks north on Grant Avenue. Take a right when you reach Filbert Street. You will have two steep blocks before you reach the stairs. From here, you will take about 250 stairs to the entrance of the tower. There are plenty of places to stop along the way so you can rest, if needed. This route is never crowded. From Coit Tower, you can walk or take the bus down the hill to the corner of Filbert and Stockton Streets where you will find Liguria Bakery. Both the bus and the Filbert Street Stairs drop you off right in front. Liguria Bakery creates the most amazing focaccia bread I've ever had in my life! It's piping hot and filled with amazing flavors. The bakery itself is a simple nondescript place with no seating. When you enter, look on the board to see what flavors they still have available. My favorites are the garlic and the rosemary, although these often sell out early. When you are ready to place your order, step up to the counter and tell them what flavor you want. Keep in mind that the people here are not paid for their friendly service, so order quickly and don't get offended by their abrupt responses. After you get your bread, step outside to enjoy it with your group (or keep it for yourself and make everyone else buy their own!). From Liguria Bakery, you are a quick walk to the playground where Joe DiMaggio learned to play baseball. Many people don't realize that he grew up in North Beach. It was his home for many years including the time when he first learned to play ball. From Liguria Bakery, walk past Washington Square Park on Filbert Street away from Coit Tower. Walk one block to Powell Street and take a right. You will then walk two blocks to Powell and Lombard Streets. The park on the corner is where DiMaggio practiced for hours on end. It's still a popular hang out for the local North Beach kids. As you walk down Filbert Street, you will also see a church called Saints Peter and Paul. On these steps is where DiMaggio and Marilyn Monroe took pictures after their City Hall wedding ceremony. As a catholic, DiMaggio wanted to create the impression to his family back in Italy that he had a proper church wedding. This is why they took pictures on the steps. If you are interested, you can step inside this church for a quick peek at its interior. After your quick Joe DiMaggio history walk, head back to Columbus Avenue for a short shopping tour. Along Columbus Avenue, starting at Union, you will find a handful of cute, boutique shops with several Italian goodies. You will also find unique jewelry, clothing and other fun items for sale. Another local's secret about North Beach is that Molinari's Deli is THE best Italian deli in the city. Step inside to order one of their delicious sandwiches with fresh baked bread. You can enjoy your lunch at one of their tables outside or eat as you continue on your walking tour of North Beach. If you prefer to sit down for a while, another alternative is to grab lunch at the Stinking Rose. This famous restaurant serves up their garlic with a little food on the side. It's slightly overpriced, but a decent meal. For garlic lovers, it's the place for a sit down meal in North Beach for lunch. Just make sure you leave for pizza for dinner! The Beat Generation of the 1950s made this neighborhood famous. This eclectic group of artists and poets spend years here and frequented several local establishments. The most famous people from the Beat Generation include Jack Kerouac, Allen Ginsberg and Lawrence Ferlinghetti. 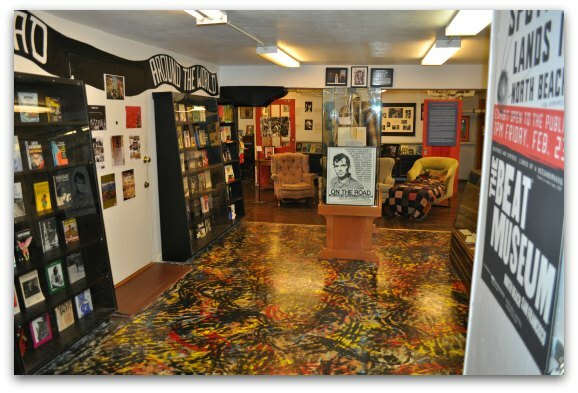 Before visiting their hangouts, I recommend stopping by the Beat Museum to learn more about them. Inside, you will find memorabilia, first copies of some of their works and little known stories about the women of this generation. It takes about an hour to walk through it and make sure you don't miss a visit to the second floor. The museum is near Columbus Avenue on Broadway Street (it's about one block east of where these two streets intersect). It's $7 to enter and open from 11am to 7pm daily. Click here to see pictures from my last visit. Now that you know a little more about the Beat Generation, it's time to head to the City Lights Bookstore. Walk back toward Columbus Avenue, cross the street and head south just one block. Lawrence Ferlinghetti founded this bookstore in the 1950s to sell unique works from his generation of artists. Even today, you will see several books that you may not find anywhere else. Spend a little time walking through the bookstore and soaking up its history. After your visit to the City Lights Bookstore, step inside Jack Kerouac Alley right next door. This alley features a few colorful murals and is worth a look. At the end of the alley is the start of Chinatown. Don't head there yet, instead return to North Beach for a stop at the Vesuvio Cafe. This small cafe and bar was the main hangout for many of the Beat Generation artists. In the 1950s, you could walk in and find Jack Kerouac sitting here almost every day. Take a seat at the bar and order one of their famous cocktails (my favorite, of course, is the Jack Kerouac, pictured above). As you enjoy your beverage, spend a little time looking around at the memorabilia on the walls. Make sure you also head upstairs for a full view of the bar scene below. 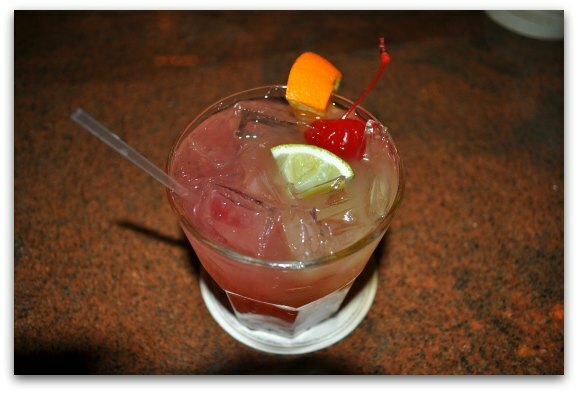 Drinks here are expensive, so plan to stay for only one or two before heading out for dinner. If you love pizza, then head back toward Washington Square to Tony's Pizza. It's on the corner of Union and Stockton Streets. The owner, Tony, is an 11 time winner of the World Pizza Championship in Italy (he's also the only non-Italian to win the crown!). He is SERIOUS about his pizza. His kitchen has four different types of ovens, so he can make the perfect type of pizza from anywhere in the world. At times, Tony's is crowded and it's difficult to get a table. It's worth the wait, but if you are low on time then head over for a quick slice at their take out place next door. Another one of my favorites is Golden Boy Pizza on Green and Grant Streets, where you can grab a couple of slices, a beer, and sit down for a while as you enjoy your dinner. If you love comedy, then North Beach is the place to see it! It's home to two famous comedy clubs: Cobb's and the Punchline. The long-running comedic musical Beach Blanket Babylon also runs in this district every night. Click here to check out the latest comedy club schedule. Caffe Trieste is on the corner of Grant Avenue and Vallejo Street. The easiest way to get here from Union Square is to take the 30 bus. Pick it up on the corner of Stockton and Sutter Streets. Take it to Stockton Street and Columbus Avenue. You will then walk one block south on Columbus until you find Vallejo Street. Head east (toward the hill – although you won't walk up it) just one block until you reach Caffe Trieste. The ride takes about 10 minutes. The 30 bus gets crowded. Don't be afraid to push your way onto the bus if there is a little room left. Some people wait for the next bus only to find it's just as crowded. Everyone on this route expects to get pushed around a little, so be polite, but do what you can to make your way on to the first one that arrives. The 30 is also your best bet from Fisherman's Wharf. It won't be as crowded heading this way, since you will get off the bus before the most popular stops. Pick it up on the corner of Columbus Avenue and Francisco Street. Take it to the Columbus Avenue and Stockton Street stop. Walk one block south on Columbus Avenue to Vallejo and one block east to Caffe Trieste. Download a printable version of The Perfect Day in North Beach itinerary. It includes addresses and all important details to take this walk on your own. In addition to the activities I outlined above, you will find a few additional things to do in this neighborhood. Click here to learn more about each one including additional recommendations for bars, restaurants and hotels in this district. You will also find tips for selecting the best guided walking tour of the area. The best way to save money on your visit is to check out the great deals on Goldstar. This online discount ticket retailer offers almost 200 half-priced tickets for tours, cruises and theater performances. The best part is that their selection is always changing. Each week, they add new tickets, which allows to you to save money on your trip so you can see even more. They often post tickets for events coming up in the next month or two, so check back often for updates. Click here to find Goldstar's Deal of the Day and other ways to save during your visit.